I hope you're having a great December. I am sure you're busy with the holiday craziness that seems to happen.. I hope you have time for some crafting.. Maybe that last minute Christmas card.. The Pause Dream Enjoy #203 challenges is here.. Check out the Orange teams inspiration over at Pause Dream Enjoy..
oh he is very cute! I like how you blinged up his frame. Thanks for sharing at Use Your Stuff! Oh Billie this is so cute! Great coloring! Thanks so much for joining us at The Sisterhood’s ‘Christmas’ challenge and please come back again soon! Adorable card Billie! That reindeer is too cute!! 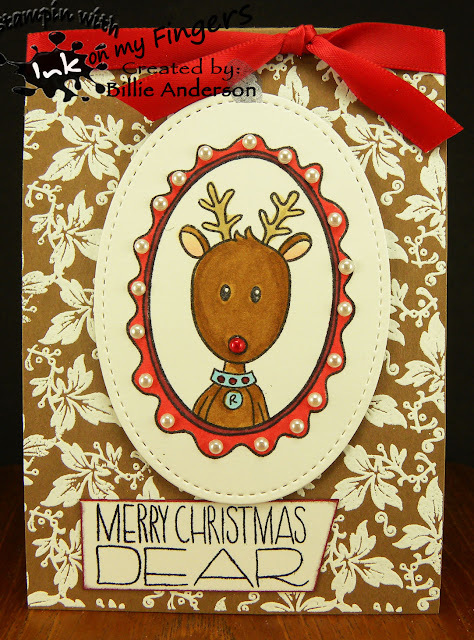 Your embossing is fabulous!! So pretty!